Probably because of my background writing and English-major-ing, I enjoy these books. For the most part I find myself able to skim through/block out the language and gore (in Dark Places I literally skipped over 5-6 pages) and view the stories for what they are: deftly-told twisted tales of some very sick people. Poe, Hawthorne, William Faulkner, and many other classic writers had some pretty dark, macabre storylines too. Before you think I’m being too generous with Gillian Flynn, though, I’d also say that her books are like a literary version of shows like Criminal Minds. But a lot of readers do not enjoy this kind of entertainment, and that’s completely understandable: you’ve got to go with your comfort level and read something you don’t feel is compromising or offensive (after all, it’s your time and energy). 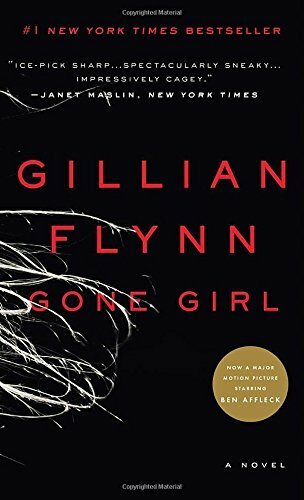 If you do want to try a Gillian Flynn and see what all the fuss is about (her first two books are being turned into movies as I type this), I’d say Dark Places is her best but most mind-blowingly disturbing, and Sharp Objects has the most empathetic protagonist. But neither are for the faint of heart. One last note: I hated the movie. It sucked out all the fun of the book, and I’ll leave it at that. I planned to save Gone Girl to read on our California vacation, but I took just a little peek beforehand and casually read the first chapter. And wouldn’t you know, the first chapter was enough to get me completely addicted. Like a true addict, I ate, slept, and breathed this novel for the next two days, resulting in some intense scrambling to prepare for the trip. OH WELL – Gone Girl was worth it. Gillian Flynn’s book is really that crazy-absorbing (emphasis on crazy), and if you are a fan of mysteries or eerily developed psychological puzzles (and if, like me, you can skim over the pretty rough language), then Gillian Flynn is worth giving a shot. The book alternates perspectives between Nick in present time and Amy through her journal. They are a couple that recently relocated from NYC to eastern Missouri and are about to mark their five-year anniversary. On the day of this anniversary, Amy disappears in a violent manner, and all of the clues, including Amy’s diary, point condemningly to Nick. Of course, things are never exactly as they seem, and neither Nick nor Amy is innocent – or reliable as narrators. The way the plot and their deceptions unravel will leave you shocked and reading like mad to figure out who’s lying and who’s telling the truth. Whether you accept the sensational climax and resolution (as well as some crazy, slightly off characterization) remains to be seen, but trust me when I say the entire book is completely nuts… and awfully fun to read. It’s hard to write anything more about the plot because a lot of it depends on absolute surprise – I want the revelations to be as extreme and surprising for you as they were for me. Suffice it to say, however, that you will not be disappointed if you enjoy an unpredictable, smart, disturbing, and addicting read. Just one piece of advice: if you buy this book for a trip, go ahead and hide it in your suitcase ahead of time or you just might not get anything done at all. This is one that we will differ on… I felt truly disappointed, considering everyone I knew gushed and raved about it! I just can’t seem to endorse books when I don’t like ANY of the main characters! And I have to say, I don’t need all books to be rated G, but the crazy amounts of cursing turned me off as well. You know, I wrote this post back in 2012, and honestly I feel like if I’d read it today, I’d probably write something much different. Especially after seeing the movie – I really, really hated the movie and it definitely tarnished the whole reading experience for me too! I think (for better or for worse) I’ve developed the habit of skimming over the language while reading (though admittedly it was VERY hard to do in this one), but once you are confronted by it in the movie, it feels so much more invasive. We went with some friends after I said the book was so interesting, and I was so embarrassed! I still think she’s an excellent writer as far as pace, suspense, and plot twists and turns, but the books would be a million times better if she cleaned them up (seems like that’s an epidemic now in Hollywood too now – sigh). But I completely agree with your comments – thank you for posting!